Welcome Restaurant Inventory Software Shoppers! FoodSoftware.com specializes in software for restaurants and offers a variety of restaurant inventory software products for Windows PCs. Products in our restaurant inventory software category are software items specifically designed for restaurant cost control. Though many of our software titles are restaurant industry standards, they are still very specialized and not found in any retail store. Note that restaurant inventory refers to all consumable supplies including food, liquor and to-go containers. Restaurant inventory software handles food, liquor, to-go containers and any other types of consumable inventory that you may choose. The summary cost control figures (key or prime costs) that result from restaurant inventory are food cost, beverage or liquor cost, to-go packaging cost, etc. Restaurant inventory software is a basic and critical cost control tool for restaurant management. Cost control is crucial to most restaurants' financial survival because profit margins are usually slim and financial loss is great unless management is professional and vigilant. Restaurants purchase and use food intensively so food purchases, stock counts and usage must be carefully tracked. Food is extremely subject to theft, waste, sloppy or unspecified portioning, spoilage, preparation loss and many other costly losses both known and unknown. Food costs are notoriously volatile and costs may change greatly from one purchase to the next. Further, restaurants are "nickel-and-dime" businesses because of the big difference that small changes in costs make to overall profits. Again, attention to detail is critical to financial survival in the restaurant business. Restaurant inventory software helps manage these problems with its ability to track a very large number of figures for hundreds of food inventory items and perform many use and value calculations quickly and regularly. Note: Restaurant "food" inventory refers to all consumable supplies including food, liquor and to-go containers. Restaurant inventory software handles food, liquor, to-go containers and other types of consumable inventory that you may choose. "Food Cost Percent" is a "key" or "prime" cost essential to restaurant management. 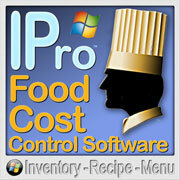 Restaurant inventory software contributes this summary figures required for basic cost control. It is the value of food used (calculated by software) divided by sales and is expressed as a percentage. Normal food cost for a profitable restaurant is around 30% of gross food sales but it may range from 20% to 40% depending on the restaurant type. Efficient restaurant managers know their restaurants' food cost percent at the end of every week. Weekly food cost percents are compared to prior figures to check that current figures remain "in line" and are not out of control. "Restaurant inventory software" usually does more than just inventory and includes closely related functions such as recipe costing, menu sales analysis, ordering and purchase requirement forecasting. Quantity and value of food purchases. Quantity and value of food on hand. Changes in inventory purchase costs also update portion costs of ingredients in recipes to give always-current menu-item costs. Recording sales of menu items enables menu item profit contribution to track sales "stars" and "dogs". Menu sales also determines "ideal" cost- what food cost should be if food use is perfectly according to plan. The highest level computes both actual food cost and food used (by regular stock counts) and ideal food cost and food used (from food depleted by menu sales) and compares them. This software also computes food purchase requirements. 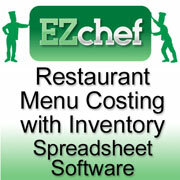 There are two main types of restaurant inventory software titles at FoodSoftware.com: "application" and "spreadsheet". Application software is stand-alone (does not need another program like Excel to run). Application software is usually more comprehensive with many advanced features. Spreadsheets require Excel to run (and familiarity with Excel). Spreadsheets are simplified and can be customized. Restaurant inventory software titles at FoodSoftware.com are for various skill levels from beginner to advanced. 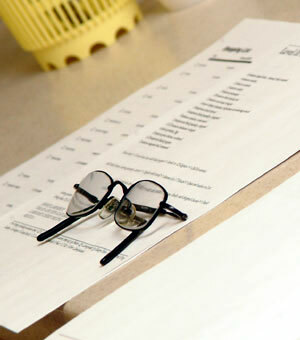 Our food inventory and costing programs range from basic and easy to comprehensive and more involved. Our spreadsheet-based software titles are generally simpler than the non-spreadsheet software. All restaurant inventory software titles at FoodSoftware.com are meant to run on all versions of Windows from Windows XP to Windows 7. Mac Users: FoodSoftware.com has very few titles that run on the native Mac OS. However, all recent Macs can be equipped with Windows, and with such, all of our Windows software will run on your Mac too. Some, but not most, of our spreadsheet titles run on the Mac version of Excel. Restaurant inventory software titles here are "restaurant back office" programs that run on your restaurant office computer or personal laptop and are not usually installed on the same computers than run your POS (cash register) software. 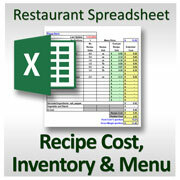 This is a popular simplified, Excel-based, basic inventory, recipe costing and sales analysis software title. Analyzes your sales mix (the sales proportions of menu items) to evaluate how each menu item impacts profitability. The Restaurant Food and Beverage Inventory Spreadsheet is the most simplified, Excel-based, basic inventory software title. Support for our restaurant inventory software products is free and unlimited for current versions. Installation policies (number of computers allowed) and multiuser capabilities and costs vary by product. Restaurant inventory software titles here may be installed on multiple computers without additional cost. Some titles are also multiuser in network environments. Some titles require additional costs per simultaneous additional user.